Playhouse With Slide - Who Has The Best Playhouse With Slide? A playhouse with slide will bring a smile to the face of your children or grandchildren, and they also bring a sense of fun to your garden. Of course different ages of children will want different kinds of slides, and different kinds of playhouses too, but with a varied choice available online, which one is right for you and the little ones in your life? 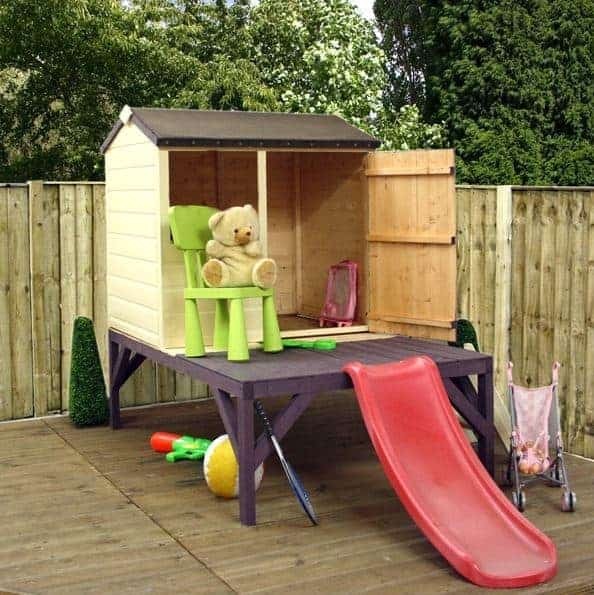 Don’t worry, help is at hand with this WhatShed guide to help you find the best playhouse with slide that can be bought online in the UK today. Just below, we explain the criteria we used when selecting playhouses, but we were delighted to find ten high class models worthy of a place in our league table. We then ranked them according to a range of important criteria, including price and value for money, visual appeal, durability, and of course that all important fun factor. Our aim when compiling this league table was to put together a guide to the very best playhouses with slides, the ones that offered something a little extra to the consumer. Whilst a playhouse with slide is still far less prevalent than playhouses in general there is still a wide range available, but we discounted ones that were very similar to other models already in our list. By doing this, we found ten high quality models that each have their own look and their own unique benefits. 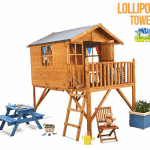 In a very competitive category choosing an overall winner was a far from simple task, so it’s well done to the Mad Dash Lollipop Tower Xtra which thanks to its large play area, extended warranty and excellent value for money, is named the very best playhouse with slide that can be bought online in the UK today. From playhouses to greenhouses, and from sheds to workshops, WhatShed bring you the independent reviews that can provide the answers to all your garden building questions. 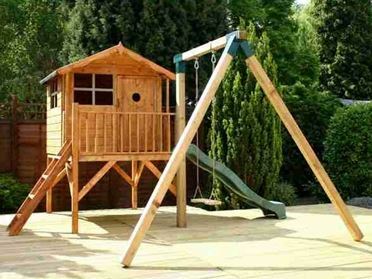 This playhouse is available as a stand alone tower in two different sizes, but it comes into its own when, as in this example, a slide is added. A playhouse with slide is an ideal garden hang out for young children because it fulfils two different functions: in the playhouse itself, they can look at a book, play with their favourite toys, or let their imaginations run wild; when they are in an energetic mood they’ll have lots of fun whizzing down the slide and then climbing back up the stairs to do it all over again. Built upon a base area of 4.35 x 2.13m, this is one of the wider playhouses we’ve reviewed, and so there’s lots of room for children to play in. With a 5 year manufacturer’s warranty included as well, we think this represents very good value for money at less than four hundred pounds, and it’s this that gains it the top spot in our league table. It wasn’t just the value that we liked about this playhouse with slide, however, as we were also impressed by the high quality of the components used throughout, and the double doors that make it easy for your children and their friends to get in and out. The slide itself is undulating and 1.78m in length, and being dark green in colour we feel it will be ideal for both girls and boys. 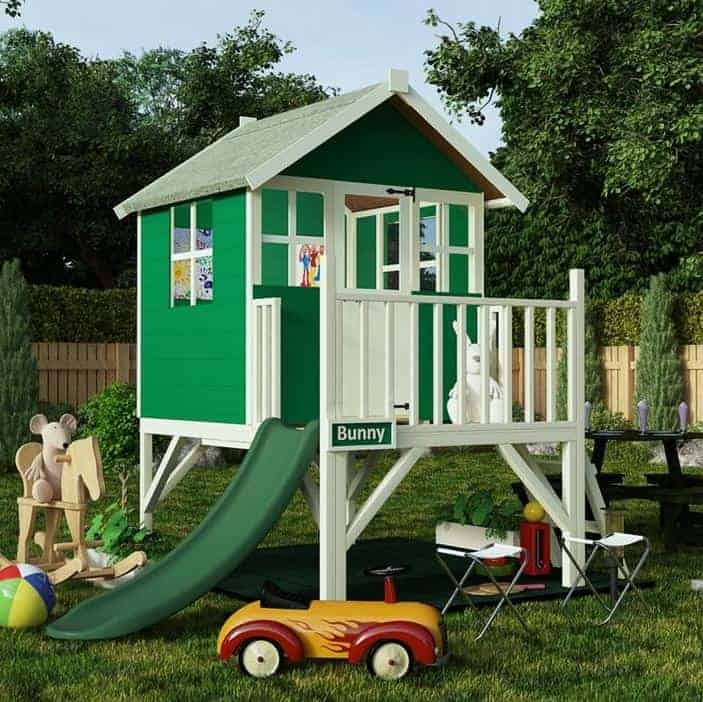 Windsor produce a wide range of children’s playhouses, but we feel that this four foot by four foot playhouse is their very best. That’s because it combines good looks that children will love, with good value for money that parents will love; that’s a winning combination that we always welcome, and it’s enough to earn this snug tower second place in our top ten league table. The asking price itself of not much more than three hundred pounds is more than reasonable considering the spacious play area, and we were impressed by the added value provided by a 10 year guarantee against rot, although of course wood preserver treatments will still need to be added by the owner on a yearly basis. As with all tower playhouses, children will need to be supervised at all times, due to the height of the platform. 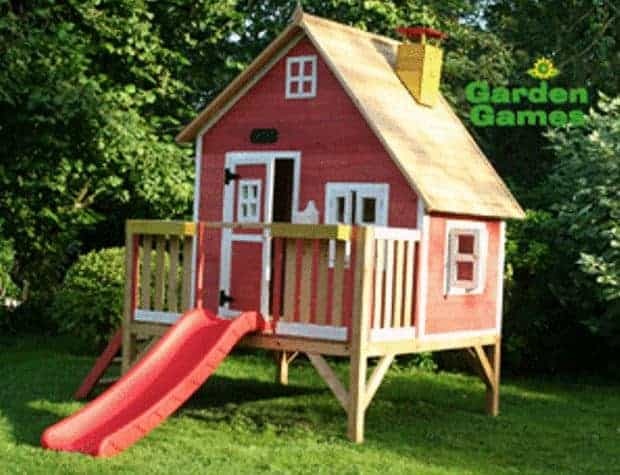 This particular playhouse with slide, however, is a little lower than most, with a peak height of 1.96m, so it’s suitable for younger children, and they’ll still love travelling down the red slide and then climbing up the three steps of the wooden ladder. They’ll also enjoy looking out of the round window surrounded by wooden petals on the playhouse door, a stylish touch that we feel will really stand out when the playhouse and door are painted. A high quality playhouse with slide is a garden feature that your children will love, and it can help keep them fit and encourage their social and creative skills as well. When extra features are added to them, however, they can become even more valuable, and even more fun to your little ones. That’s one reason why this Marc Axi playhouse stood out for us, and why it gained a place within our top three; not only does it have a spacious and well built playhouse with a long undulating slide attached, it also has an integrated sand pit underneath it. This extra dimension allows children to play games such as boules, or they can simply stomp around in it and built sand castles. The sandpit is sure to draw youngsters’ eyes towards this playhouse with slide, but we found the building as a whole to be well designed and attractive. We particularly liked the arched door and windows, and the round window at the top of the playhouse that ensures a good supply of natural light reaches the interior on a sunny day. 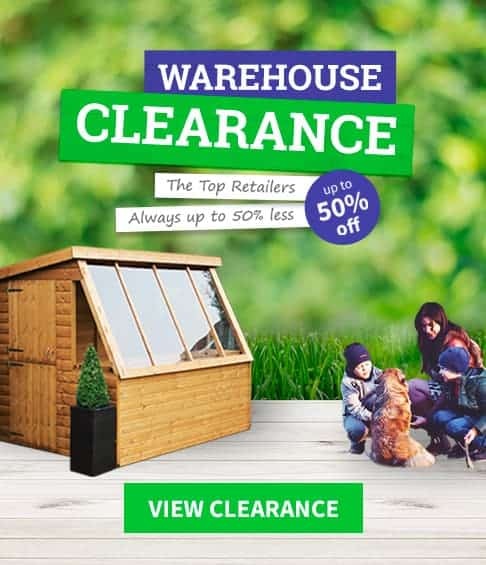 We appreciate that the asking price may put some people off however, even with a five year warranty included, which is the only thing stopping this feature packed playhouse taking one of the top two spots in our league table. Once again we have not only a well built and durable playhouse with slide here, but an extra fun element that turns it into a children’s activity centre. The first thing that grabbed our attention when reviewing this playhouse was not the playhouse itself or the long green coloured slide that extends from it, but the swing. This will come in particularly useful for energetic children who love to be outdoors as they can alternate between swinging to and fro, climbing the stairs, and sliding back downhill again. Of course, as with all the playhouses to feature in our league table, it does meet all the necessary EU safety requirements. We were impressed by the tongue and groove cladding used for the walls of this playhouse, and although the roof and floor are made of more cost effective OSB it should still feel reassuringly strong and stable once assembled. We would have liked to see an extended warranty provided however, rather than the statutory one year guarantee. 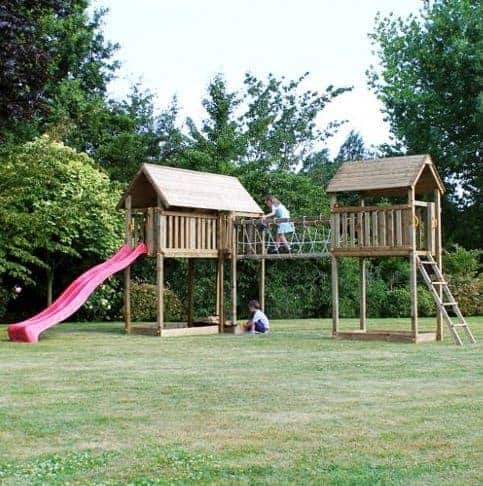 We also accept that the price is a little higher than average for a playhouse with slide with a base area of 1.84 x 1.51m, but the swing does add significant extra value, as well as significantly more fun for the youngsters in your life. 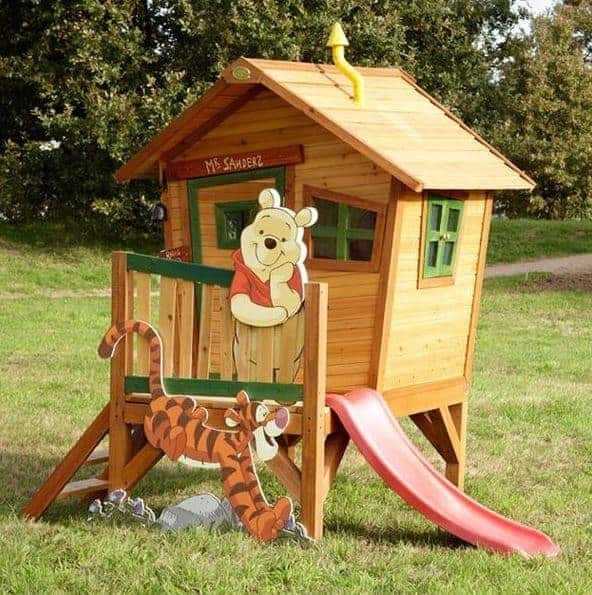 There are few more loved children’s characters than Winnie The Pooh, so if your children or grandchildren love the adventures in the hundred acre wood then this could be their perfect playhouse with slide. This is a playhouse that puts the emphasis on fun, and it brought a smile to our face, so it’s sure to enchant the little angels in your life. With a width of 2.75m and depth of 1.57m there’s lots of room to play in and have fun too, whether playing games in the playhouse itself, or journeying down the rose coloured slide. The first things that caught our eye were the wooden cut outs of Winnie The Pooh, leaning with a smile on the slatted balcony, and Tigger, but the whole of the building is beautifully designed. Nothing is parallel on the playhouse, from the windows and doors to the walls themselves, which lean outwards, and a yellow chimney pot that bends in the middle pokes out from the apex roof. 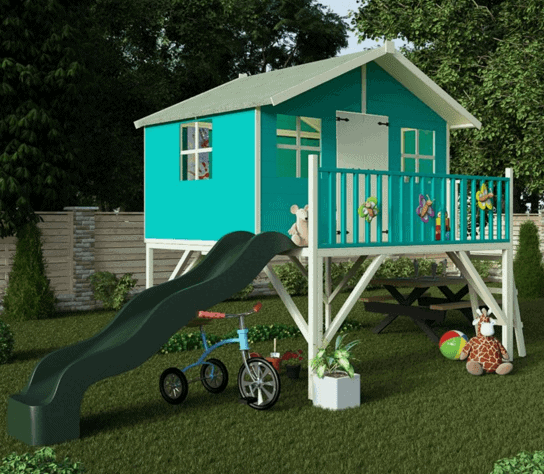 This is a truly eye catching playhouse with slide, but it comes with a higher than average price tag as well, which is why it doesn’t gain an even higher position in our league table. If you have a Winnie The Pooh loving family, and the necessary budget, then this should be at the top of your playhouse shortlist. Everyone knows that children love playhouses that are in fun and vibrant colours, but that can cause a problem to parents who are short on time, or who aren’t confident enough in their painting ability. 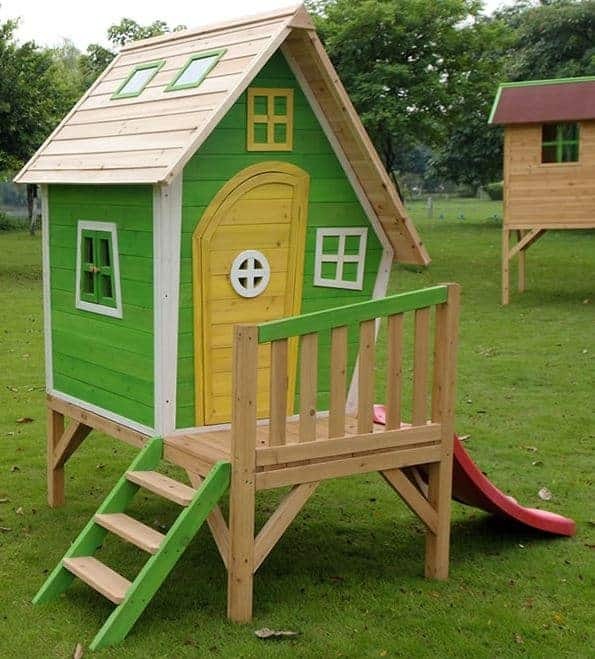 That’s why we love the whacky tower playhouse with slide: it comes pre-painted in an exciting green and yellow colour scheme, so saving the owner both time and money on the materials that would otherwise have to be used. 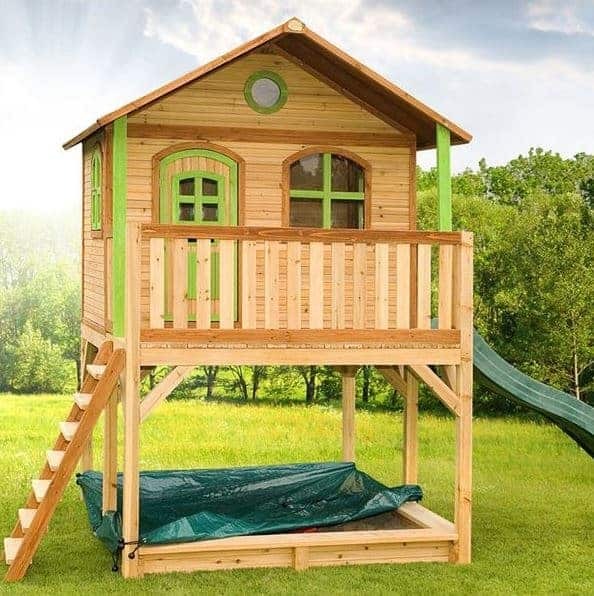 Taking this into consideration, we also feel this tower playhouse represents excellent value for money, although we would have liked to see an extended warranty provided as well. It’s not just the colour scheme that caught our eye, but also the offset apex roof and the trapezium shaped windows. We also liked the curved top to the door, and the round window in the centre of it. Nothing about this playhouse with slide is straight forward, but that of course makes it even more fun to youngsters and it has a cartoon like feel to it. With two skylights in the roof, there’s also going to be lots of light inside the 2.43 x 1.52m interior, creating a safe and welcoming environment for your children or grandchildren to play or relax in. As with the lollipop model that tops our league table, this BillyOh model can be purchased as a simple tower playhouse. We feel it reaches its full potential when it becomes a playhouse with slide, however, which is why it takes its place inside our top ten. It has a classic design, with a wooden balcony at the front of the raised platform, an apex roofed playhouse with four square windows and an apex roof at the top, and a slide and steps at opposite ends of the verandah. That’s why we feel it will not only appeal to children, it will also act as an interesting feature that enhances your garden as a whole. With a base area of 2.31 x 1.70m this is very much a mid sized playhouse with slide, although the apex roof is a little taller than we often find, which gives it a peak height of 2.12m. We were also impressed with the quality of materials used, from the styrene windows that are safe and shatter proof, to the strong roofing felt. With all these positive features, we feel that the asking price of less than two hundred and fifty pounds represents very good value for money, and it’s only the lack of an extended warranty that prevents this playhouse taking a spot in the top half of our table. This is the second pre-painted wooden playhouse with slide to earn a place in our league table, and this one has a larger base area to offer with a width of 2.37m and a depth of 2.30m. This of course means that there’s more space for children to play in, making it suitable for a slightly older child, or simply allowing them to enjoy the playhouse and slide with their friends. It also comes with a price tag that’s more than two hundred pounds higher than the same manufacturer’s ‘whacky tower’ that we looked at earlier, and that accounts for their relative positioning. Once again, we were very impressed at the quality and vibrancy of paintwork. This time the playhouse and slide has been designed with girls in mind, as it comes finished in a pretty pink colour scheme with a pink slide leading out from the centre of the raised platform. Although it has an asymmetric roof, with a yellow chimney pot that we found particularly fun, it’s a more harmonious look than the whacky tower. Another feature we particularly liked is the blackboard above the door, which your child can chalk their name onto. This is one of the most attractive playhouses we’ve seen, so if you have a pink loving girl it certainly deserves consideration. 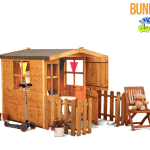 This is the smallest playhouse with slide to feature in our WhatShed league table, which makes it ideal for younger children with the usual caveat that they must be supervised by an adult at all times. It’s also the cheapest model, which was the main factor behind its appearance here. 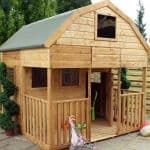 If you have a small budget but would still like a well built playhouse with slide that will light up your child’s face when they see it, then with an asking price of less than two hundred pounds this could be your perfect purchase. The base area upon which this playhouse with slide stands is 1.15 x 0.90, but there’s still enough room inside to hold a good number of board games and toys, or even to play host to a doll’s tea party. We were very impressed with the quality of timber used, as it’s both smooth planed and has rounded edges. This also makes it strong and weather resistant, as there is no space for rainwater to seep through, and we were pleased to find this confirmed by way of a 10 year manufacturer’s guarantee against rot. This occupies the penultimate spot purely because of its compact size and simple design, although of course these can also be benefits if you have a younger child or small garden. 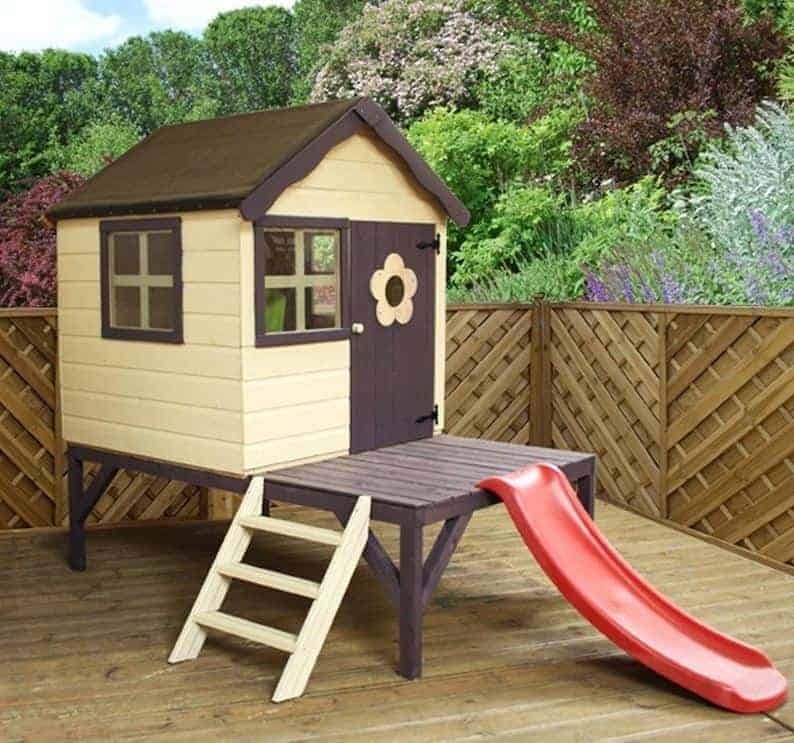 This is by far the most expensive playhouse with slide in our league table, with a price tag of approximately fifteen hundred pounds. 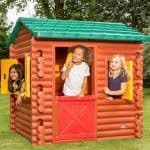 This accounts for its position in the tenth and final place, but for those with a budget to encompass it this really is a superb playhouse that children will surely love. In effect it’s two playhouses in one, as there are two towers with an apex roof covered platform to act as a playhouse. Between them runs a fun, and yet safe, bridge, with ropes at the side, and leading down from one is a long magenta coloured wavy slide. This is also the largest and also the tallest playhouse with slide to feature in our list, and this means that your children will enjoy the slide even more as it will take them longer to reach the bottom. It also means that it will take them longer to climb back up again, which is great for burning off some of that excess energy. We were very impressed by the quality of the timbers used, and especially by the fact that they have been pressure treated to give a long lasting protection against rot. This not only means that it comes with a long 10 year warranty, it also means that the owner won’t have to spend time and money adding their own wood preserver coatings.